I have started to use a Saitek X52 joystick and see I have 3 separate Modes. a) Can I program each of the modes in FSUIPC? B) If so how can I do it,please? Also I would like to assign the FSX F2 Thrust Reverser command to a joystick button. I have looked in Buttons & Switches, pressed a button, selected "Select for FS control" and looked in the "Control sent" window but cannot see a Thrust Reverse command. I have tried looking in Key Presses tab and drawn a blank there, too. I have used the default FSX B737 but cannot make the reverser work. What command should I be looking for, please? I am using FSX with Win 7. Do all the buttons and switches show as different buttons in FS or FSUIPC for each mode? If so: yes, just by simple assignment as you would in FS. If the answer is no, then it depends on whether the mode switch itself is seen, because then there are ways of setting flags or conditions for each mode. If it is, you can program by INI file editing, using the conditional actions as documented in the Advanced Users document. Also I would like to assign the FSX F2 Thrust Reverser command to a joystick button. I have looked in Buttons & Switches, pressed a button, selected "Select for FS control" and looked in the "Control sent" window but cannot see a Thrust Reverse command. There's no such thing, that's why. FS's "F2" button is assigned to "Throttle Decr". So the FS command to use is "Throttle Decr" (or, for different engines, ThrottleN Decr where N is the engine number). I'm pretty sure you can assign these in FS as well. And if you look at the FS assignment for the F2 key you would have found the correct command. Sorry, I don't know what you mean by this. Using F2, or using the mouse on the throttle quadrant reversing levers, you can't engage reverse? The buttons etc do not show as different buttons in FSUIPC. If they did I would not be asking the question. How can I tell if the mode switch is seen? What test can I carry out to find out if this is so? For info the F2 button is assigned to "Throttle Decrease" in FS, but holding it down it becomes the "Reverse Thrust" command which is what I want, hence the question. By saying I was using the default FSX 737 I was trying to point out I was using a plane with thrust reversers so if the command worked it would be apparent on the aircraft. If the X52 is similar to the X45, the Mode switch is seen as a seperate 3-position switch. see it listed under the "Switches" heading. you would use to create compound control functions. of the other buttons, axis, rotaries etc. I am using Win 7 so the page names are, of course, different. In Win 7 "Game Controller" = "Devices & Printers". This will eventualy take me to X52 Controller Properties. By rotating the knurled knob the 3 Mode positions show and the Mode no on the controller changes from 1 to 2 to 3. Starting FSX and then FSUIPC when I go to "Buttons & Switches" if I press joystck button A in Mode 1 the Button Window shows Joy# 0 and Btn# 2. Changing to Mode 2 I see Joy# 0 and Btn# 28, then pressing button A the values revert to Joy# 0 and Btn# 2. Changing to Mode 3 the result is Joy# 0 Btn# 29. Again, presing A shows Joy# 0 Btn# 2. Thus it seems that changing the Mode knob simply adds 2 more buttons to the controller rather than multiplying the number of controls by 3. Why anybody should want so many buttons I cannot guess, they must have a fantastic memory to remember them all. It may be that FSUIPC cannot support X52 in Win 7, it would be good to have it confirmed one way or another. This is exactly correct. The "Mode" knob looks just like 3 switches in FSUIPC or Win7 for that matter. other buttons/switches do anything different unless you program them to do so. defined in the FSUIPC documentation. Add the Lua capabilities and the possibilities are endless! when flying them. The time you spend investigating the advanced techniques will be well spent. And keep that document "handy", along with "List of FSX controls.pdf" and "FSUIPC Lua Library.pdf". sticks like the X-45, and I assume the X-52, also have the "pinkie switch" that is essentially a "mode" switch. on the screen in a small Lua Display window for 10 seconds each time I change the control set switches (mode switches). Here are the JPG representationsd of two of my BMP pop-up "reminder panels". Thank you for your help. I have printed off all your words of wisdom and will now sit quietly in a corner to digest them together with the files. For info the page nos you referred to are now 19-25 in the updated FSUIPC 4 manual. I have been searching the internet and your advice pops up very frequently - Thank you. I hope you had a good re-union with your shipmates from the USS Dewey and can remember it. Thanks. Yes, I did have a great reunion with my Dewey shipmates old and new. just drop me a PM and I'll try to help you out as time permits. You replied to my earlier question about Modes "If the answer is no, then it depends on whether the mode switch itself is seen, because then there are ways of setting flags or conditions for each mode"
Following a lot of help from Gypsy Baron over the Christmas period the answer seems to be "No". I am using the default FSX Cessna and have programmed a set of instructions in the X52 stick's Mode 1 which works perfectly. What I had expected to happen was when I go to Mode 2 and press, say stick Button 2, nothing would happen. Instead the flaps still retract (a Mode 1 setting), using Mode 3 produces the same result. Thus only Mode 1 seems to be effective. Rotating the Mode switch whilst in the Buttons & Switches tab shows no effect in the But# box or the Joy# box so it looks as if FSUIPC (version 4.60a dated 4/3/10) does not see the switch. 4.60a seems to be the most recent version which I registered earlier this year; does the fact I am using Win 7 32 bit have any relevance? Is there an update for Win 7 that I have missed? For safety I have uninstalled and re-installed the Saitek drivers also, looking in the Saitek X52 Pro properties box rotating the Mode switch changes the Mode bars in the "Properties Window" and also the Mode number changes in the throttle MFD display so I know the stick is functioning properly. I have tried ticking and un-ticking the Enable Controllers box in the Controller window but that does not make any difference. There is a later version (4.645) in the Download Links subforum, but I doubt it would make any difference. does the fact I am using Win 7 32 bit have any relevance? No. FSUIPC4 uses DirectInput for its buttons and switch inputs and that supports 32 buttons of which FSUIPC sees all. That's DirectX8. Maybe DirectX9 or 10 or 11 supports more, but I doubt whether Saitek requires anything so recent as it would have limited their market. It sounds instead as if that switch is either interpreted internally, or only by their driver. FSX itself wouldn't see it either. FSUIPC only sees what FSX can see. There is a program called SPAD (see the Download Links subforum for a reference) which might be able to read it. It operates the USB protocol. Win7 makes no difference whatsoever. Hi, the modal button does work and it changes the joystick # as seen by FSUIPC accordingly. The trick is, you must install the appropriate Saitek driver for your particular device and operating system. You do not necessarily need to install the Saitek SST software, just the driver. You'll know it's ready to work with FSIUPC if you can see the three-light modal button in the Game device calibration panel. I used to use it and have all sorts of button configurations with my Saitek Yoke and Throttle, but it got to be too much to remember and maintain, so I reverted to the KISS method a few years back. Interesting discovery vis-a-vis Saitek "Mode" switch which is in this Forum. Gypsy Baron was helping me; as a result of his help and support we found that the X52 properties window needs to be open to make Modes 2 and 3 work in the X52. 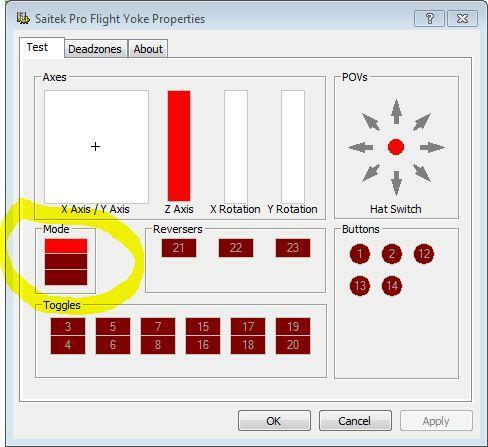 The Mode button in the X52 Props window changes but nothing happens in FSU if the Props window is not showing. In addition a few buttons on the throttle now display which previously had shown in the Properties Window but not in FSUIPC. If I close the X52 Properties window I lose Modes 2 and 3. Strange but true. My suggestion would be if you are going to use fsuipc to program your Saitek, dump the Saitek drivers and just use the default win 7 ones. AFAIK all you get with the Saitek drivers is the "auto-calibrate" feature of Saitek which never worked well for me anyway. I just got the X52 last week and read your post after trying to get FSUIPC 3.99 (registered)to work with FS9. It really is a strange situation. I found that the Saitek "clutch" button on the joystick that lets you switch profiles on the fly with the Saitek SST software shows 3 different button values with the X52 Properties window open and I change the Mode switch, but not when closed. Guess I will have to read Pete's buttin programming and use some other button to get different modes. Despite Gypsy Baron's good work helping me sort out this mess i eventually went back to using the Saitek software. The Sitek instructions are not that helpful but once you have puzzled them out the stick works. Alternatively just use the FS set up instead, but don't try to use a combination of FS and SST. Only one or the other. If you read Pete Dowson's reply to Gypsy Baron's post you will see that there does not seem to be a "workaround" to overcome the problem, which I why I went back to SST. Actually, you can use the F2 button for reverse via the X52 and FSUIPC. I have done this many times with great success. However you have to check the "enable joystick" in MSFS using a mix of FSUIPC and your controller. Caviat here is that you might have your axes reset into MSFS rather than staying put via FSU. I find that rarely happens. GO TO THE SELECT FOR KEYPRESS SIDE. Push your "F2" Button on your keyboard. (Selects Reduce throttles in MSFS). Select Keypress to be repeated while held. (Self Explanitory). Push the (Second) "Set" Button. Push your F1 Button on your keyboard. (Sets your throttles to idle when you release whatever button you assign this to). (NOTE) After figuring out axis range and multiple commands on one axis I now have my reverses and spoilers on my x52 slider via FSUIPC. Seemed logical as in jets you'd use them in that combo on landings. Of course I set this into my jet profiles as well. Gotta love profiles. For my needs I find that I can get by with only the Saitek profiles. I would like to use the FSU profiles but it seems senseless to have a multimode stick which needs to have work arounds to make it function "as advertised". But I will print your comments in case I ned to use them sometime. .. For my needs I find that I can get by with only the Saitek profiles. I would like to use the FSU profiles but it seems senseless to have a multimode stick which needs to have work arounds to make it function "as advertised". .. I am new to Saitek. If using just Saitek software and flying single and twin engine ... do the MSFS "axes" all have to be reselected in MSFS each time you change aircraft? I know in FSUIPC you can program "aircraft specific" profiles. Also, Why is this (SaiD0BAC.pr0) deleted in your example here? MSFS settings are unchanged from plane to plane. If you want to change anything for a particular plane you must go to "Settings" and do it. The advantage of FSUIPC is that you can have specific profiles BUT be sure to delete MSFS settings that you want FSUIPC to manage. If you use the SAITEK software for programming you can develop profiles for different planes, conditions, etc. The software also makes the three modes function. I am about to start fresh on setups on my new PC. I will only be using one single engine prop, one twin prop, and two twin engine jets. Thus the questions here for Saitec or FSUIPC (throttle/yoke) profiles. My first thought would be to use FSUIPC only. "MSFS settings are unchanged from plane to plane." "If you want to change anything for a particular plane you must go to "Settings" and do it." What assignment have you had to change for your aircraft? And would this assignment have to be change again in MSFS before flying another aircraft? "The advantage of FSUIPC is that you can have specific profiles BUT be sure to delete MSFS settings that you want FSUIPC to manage." Could I have a couple of examples? Here I assume you want to delete a MSFS key assignment you never use (like cowl flaps) and use that same key in your new aircraft to like turn on a fuel pump. "If you use the Saitek software for programming you can develop profiles for different planes, conditions, etc." 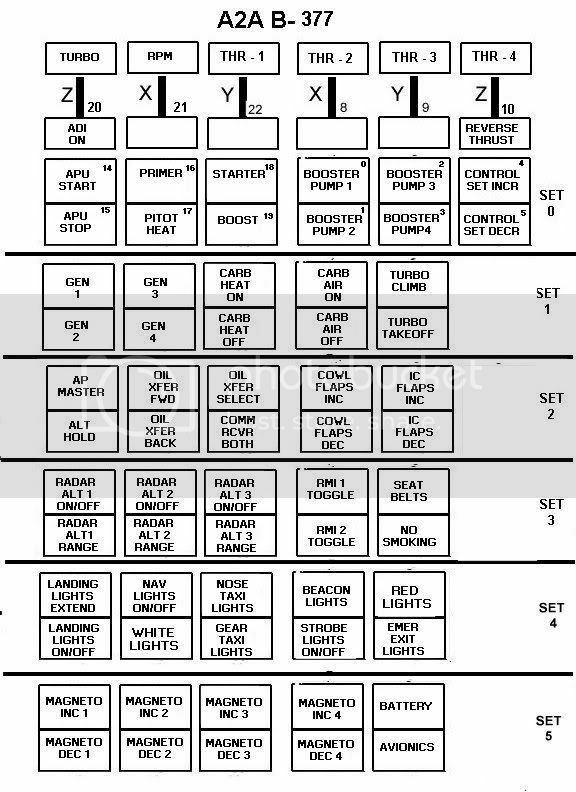 If I use Saitek software and assign Z axes for throttle on Siatek TQ. I must also now assign the throttle axes in MSFS to the Siatek TQ lever e.g. flying a single engine Cessna. And each time I use SiateK software profile with more engines I have to set up MSFS"s axes assignments before each flight. In other words, Saitec profiles will not automatically reconfigure MSFS axes when changing planes? "The software also makes the three modes function." OK. that is an advantage for using a lot of buttons. Thanks for your reply; unfortunately it is a bit too cryptic for me to understand. Do you mean that you can make all 3 modes on a Saitek X52 Pro run in FSUIPC by using the file C:\.....<= ? Can you please explain bit a bit more about what you have done to make the 3 modes work? I appreciate your comments, it seems that others have found the same problems that I have, so we can all benfit from your knowledge. (it's with the rest of the saitek driver files) and remove it. 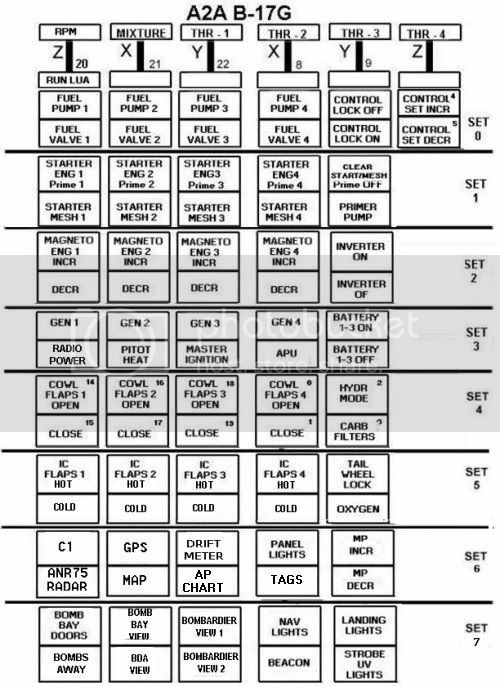 You can then programme buttons 16,19,32 and 39. I've done this from my first X52 and my X52pro without any ill effect."